As you all know we got a major upgrade of the town's seasonal lights this year. This enormous project was undertaken by Cahir Development Association, Cahir Tidy Towns and the Promoting Cahir Group. Nellie Williams of CDA took on the task of purchasing the lights and overseeing the project. The funding came by way of two major sponsors in Cahir Credit Union and Tipperary Co Co who together agreed to pay for the lights over three years along with the CDA Community Lotto, Cahir Community Bingo, Cahir Tidy Towns and the Cahir Meet and Train Group. A loan was secured from the credit union to purchase the lights and we are very grateful to the two members of Cahir Development Association who guaranteed this loan. There is a considerable positive reaction to this new light project from Cahir Traders who have contributed very generously once again this year. It is their continuous support that ensures the erection of the lights each year. Thanks to the members of Cahir Tidy Towns and to the staff of the County Council for their traffic management throughout the town over the past number of days. A very sincere thank you to Kieran Burke of Burke's Ironworks who stepped in at the last minute and made the frame for the Christmas tree that now shines so brightly on the square and to Niall Grogan of Tree Fields Nurseries for supplying the tree planted at the Mall entrance. The hard task of erecting the lights was completed very professionally by Stephen Flannery who has ensured that the town will look very festive over the coming weeks. 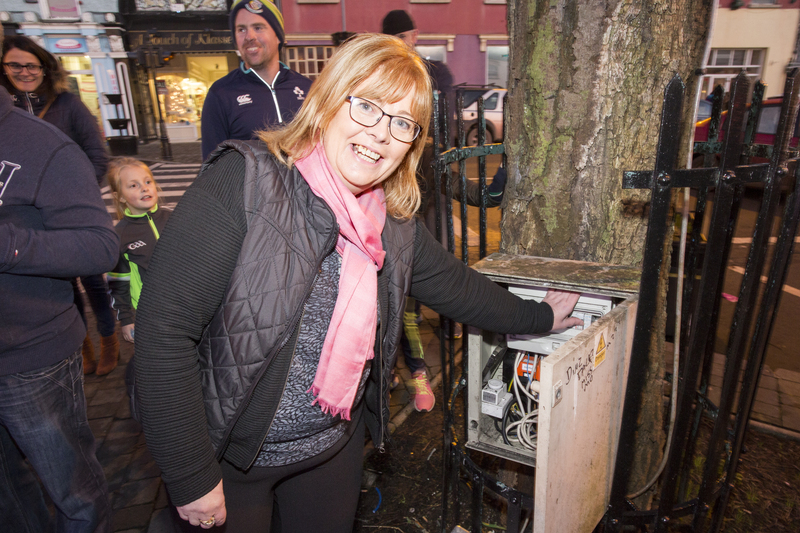 The official switching on of the lights took place on the square Saturday evening. The crowd was entertained by Cahir Youth Choir and the sweets went down a treat also.